Born in Philadelphia, John Frost painted luminous, colorful views of the Sierras, desert landscapes of Arizona, and some village scenes. 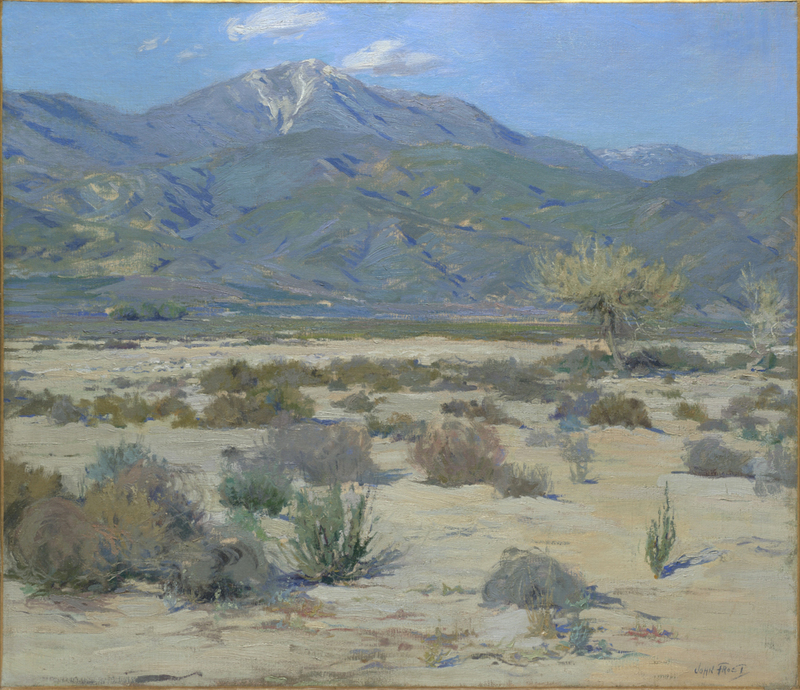 He was one of the few California artists whose work had a pure French Impressionist style, and of this painting style it was written the he was a Californian who “did not hesitate to apply the delicate Impressionist technique to as uncompromising a place as a desert.” (Moure 165). However, his brief life was curtailed by tuberculosis, and his paintings are scarce. He was the son of famous illustrator Arthur B. Frost. Called Jack, he studied with his father and in Paris as a child at Academie Julian under Jean Paul Laurens. From 1906 to 1908, he painted in Paris with Richard Miller and often visited him at Giverny, the Impressionist Colony that was the home of Claude Monet. From 1912-14, he was a patient in a tuberculosis sanitarium in Switzerland and then became a successful illustrator in New York City. From 1919, seeking a dry climate for his health, he lived with his family in Pasadena, California where he was much influenced by his father’s close friend, painter Guy Rose. The three men went on numerous painting excursions together. Frost’s paintings were often exhibited at the Ambassador Hotel in Los Angeles, and he was a member of the California Art Club and the Pasadena Society of Fine Arts.